Torus palatinus, also known as palatal tori, tori palatinus, palatinus torus, is a benign, bony growth on the roof of the mouth. This growth is one of the most common types of growths in the oral cavity. It is not a cancerous growth and is not painful or sore in most cases. Torus Palatinus can occur in different shapes, such as nodular, irregular, spindle-like or lobular shape. Due to the bone density, the Torus Palatinus appears to be hard on palpitation as well as opaque, when tested in radiology. The word torus originates from the Latin word torus which means bull, or a lump, or to stand out. These lumps are mostly non-life threatening. • Flat tori- This type of Torus Palatinusgrowth has a flat structure. It grows from the midline of the palate and has a smooth and broad base. When the mass of Torus Palatinus grows, it grows symmetrically on both sides. • Spindle tori- This type of Torus Palatinus growth is in the shape of a slender rod, and is usually furnished with tapered ends. These tori appear as a ridge in the middle of the palate. • Nodular tori- These types of Torus Palatinus grow in multiple nodules and have multiple structures or round outgrowths. Each nodule has their own base. However, in severe cases, these nodules merge to form a large singular nodule. • Lobular tori- This form of Torus Palatinus have a lobe-like structure. They share a common base and arise from the midline of the palate. The Torus Palatinus is a bony outgrowth which is found primarily on the midline of the palate. However, there is another type of tori growth which can be found in the oral cavity. This is known as torus mandibularis. This type of bony, mass structure grows in the lingual area of the lower jaw or the mandible. Both of these growths can obstruct the natural oral functions, oral movement, as well as interfere with the construction and utility of dentures. • A growth on the upper part, or the roof, or palate of the mouth which has a diameter of two centimeters or more. However, this mass can grow over time and take on a larger shape and size. The growth can have different shapes, such as flat, lobular, ridged, knob-shaped, nodular, etc. • Most of the cases report that the growths are now painful, however, as they grow in size, they can cause irritation in the mouth. These masses are made of bone and covered by a soft, firm, pink, non-resilient tissue in the mouth. Patients can have difficulty in eating, drinking or swallowing. • For patients who wear dentures, the Torus Palatinus can interfere with the placement of the dentures. This can cause a spread of infection, and eventually cause ulcerations and pain. 1. Hereditary, or genetic factors. 2. Blocked salivary glands can also cause this growth. Generally, saliva flows from the salivary glands to the oral cavity. However, if the ducts get blocked due to some reason, the saliva accumulates and creates a bump. 3. Superficial injury or trauma to the oral cavity can also cause torus palatinus. 4. Vitamin and mineral deficiency. 5. Tooth abrasion, excessive grinding of the teeth, clenching of the teeth can also cause this condition. 7. Chewing excessively or forcefully can cause this condition. 8. The use of certain drugs. Torus Palatinus is a benign growth which is harmless, painless and does not cause any obstruction in most cases. Most patients with Torus Palatinus will simply ignore it. This growth is not life-threatening and in most cases, will not cause any sores of infections. The rate of growth of Torus Palatinus is also very slow in most cases. However, when the growth of the mass is growing at a faster than usual rate, causing irritation, pain, ulcerations, or even difficulty in eating, drinking and swallowing and putting in dentures, the mass is removed. When a patient starts to notice an abnormal growth of their Torus Palatinus or experiences any of the above symptoms, the patient must visit a doctor before the symptoms increase. Since the Torus Palatinus usually grows to about 2 centimeters in diameter, most people do not get it treated, as it is not a life-threatening condition. Only once that a patient starts to feel discomfort or irritation caused by the growth of mass, that the patient may visit a doctor. Torus Palatinus is a harmless, benign, bony growth which is seen in about 20% of the population without many serious complications. Usually, the Torus Palatinus is diagnosed during a routine dental check-up, or when the patient visits the doctor due to pain or irritation caused by the torus palatinus. In most cases, surgery is the main option of removal of torus palatinus. However, in some cases where palatal lesions are suspected, a differential diagnosis is important. The differential diagnosis of a Torus Palatinus is performed to check the malignancy of the hard palate of the patient. This differential diagnosis is performed by taking a biopsy of the tissue from the palate of the patient’s mouth. Some of the complications associated with the removal of Torus Palatinus can are infection, oral nasal communication, pain, and necrosis of the palatal tissue. In most cases, Torus Palatinus is considered normal, harmless and benign. Treatment of this mass is not required. In cases where the growth rate of the mass is increasing and causing obstruction with the patient’s life, doctors offer to remove the torus palatinus. The main method of removal of Torus Palatinus is through surgery. During surgery, a certain amount, or most of the amount of bone from the Torus Palatinus on the palate is removed. This surgery is done under general or local anesthesia by a maxillofacial surgeon. The recovery period from this surgery is two to three weeks; however, this may vary from person to person. Rinsing the mouth with salt and water can help in speeding up the recovery process. It is also recommended to only have soft foods during the recovery period. Often, the patient will be given painkillers and other medication to treat the pain after surgery. There are no medications available for the treatment of torus palatinus, as the growth does not present any symptoms of pain, soreness or irritation. In most cases, the growth is completely natural and harmless. While there are no other related or linked diseases with torus palatinus, as it is a relatively harmless, non-cancerous growth, obvious irritation, difficulty in eating, drinking and swallowing are visible. Patients who wear dentures can experience some problems with the adjustment of their dentures due to the presence of torus palatinus. This can cause painful ulcerations and even the spread of infection. There are no major complications reported after the surgery for the removal of torus palatinus. The recovery time is about 2 to 3 weeks, but this can differ with individual patients. The possible surgical complications can include pain, infection, bleeding, swelling, poor healing, etc. However, these complications usually go away after the recovery period of two to three weeks. 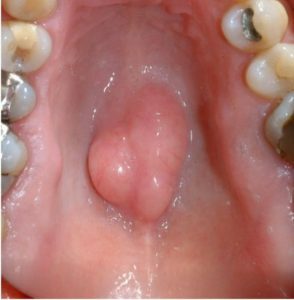 While the massive growth of bone and tissue at the roof of the mouth can look cancerous, Torus Palatinus is actually not cancerous. It is simply an excess growth of bone and tissue, and in most cases, it is harmless and does not need to be surgically removed or medicated. Can Torus Palatinus present in babies as well? Torus Palatinus can present in babies, toddlers, and infants, however, in most cases, Torus Palatinus is presented in children of 6 to 12 months of age. 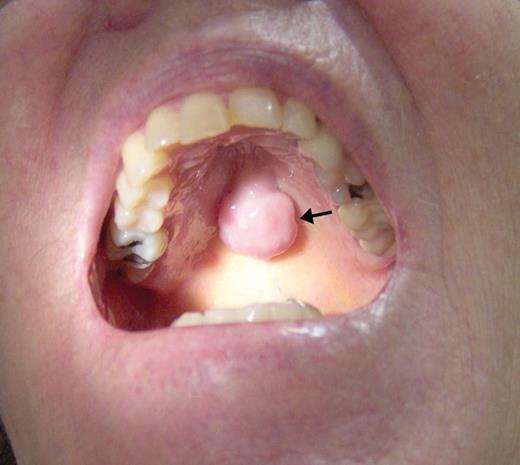 Torus Palatinus is commonly seen in older patients, or in babies born with rare genetic conditions in the upper palate. How can I find out if it is cancer or a tori? • Cancers of the mouth are rare, where the growth of a tori in the mouth is very common and natural. • Cancers are usually found in the soft tissues of the mouth and the cheek. They are red in color and asymmetrical. • Cancers can present symptoms such as numbness, or a tingling sensation in the tongue and the lower lips. • Tori occur on the midline of the palate or in the mandibular region of the mouth cavity. They usually have a distinct shape and are painless. © 2019 Health Diseases. All Rights Reserved.